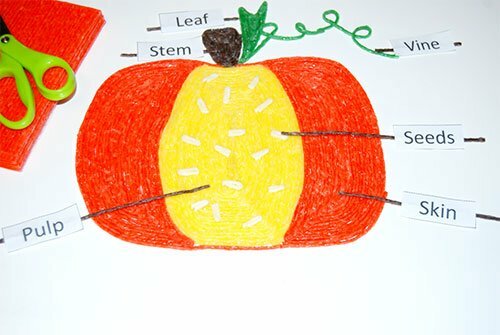 Parts of a Pumpkin Learning Craft for Kids! The season of fall offers many opportunities for exploring, playing, and creating with kids. Learning about a pumpkin is a fun way to engage kids in the wonders of fall. Invite your own kids to play and create the parts of a pumpkin with a FUN Wikki Stix learning craft this fall! 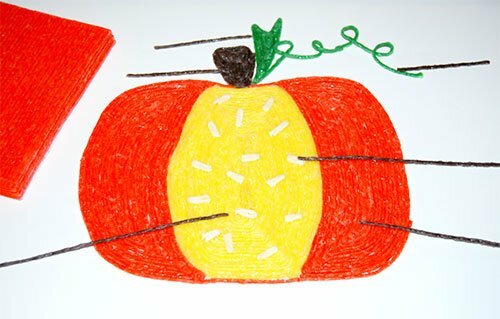 Wikki Stix Parts of a Pumpkin Learning Craft for Kids! 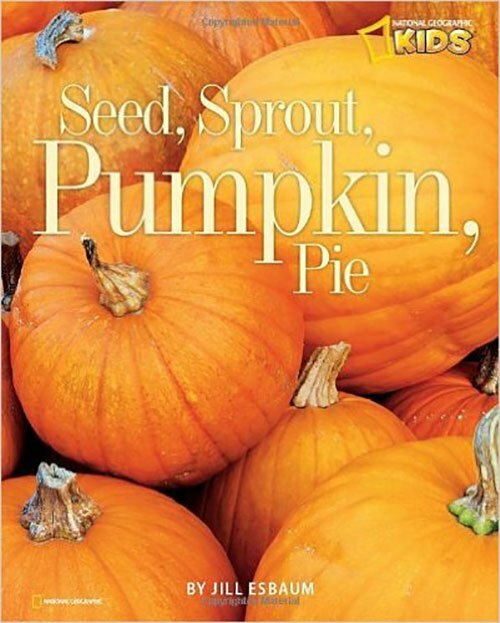 Seed, Sprout, Pumpkin Pie by Jill Esbaum is a great book to introduce the season of fall before creating the Wikki Stix parts of a pumpking craft. The book brings pumpkins and fall to life with wonderful illustrations that capture the rich flavors, scents, and textures of the season. Invite kids to use orange Wikki Stix and create a basic pumpkin outline on the mounting paper. Kids can create a stem for the pumpkin with brown Wikki Stix and a leaf/vines with green Wikki Stix. 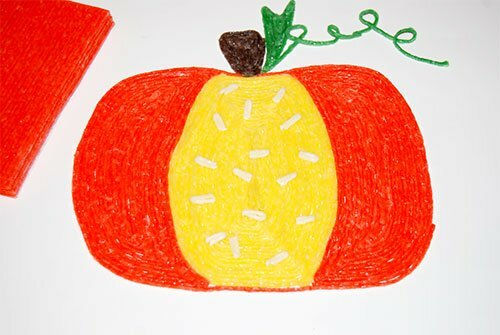 In the center of the orange pumpkin outline, kids can create an oval shape with yellow Wikki Stix to resemble the pulp of the pumpkin. Kids can then fill-in the entire yellow oval with additional yellow Wikki Stix. 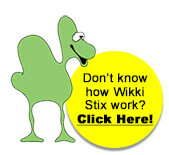 Note: Wikki Stix is a great tool for enhancing fine motor strength and control. After finishing the yellow pulp portion of the pumpkin craft, kids can then use orange Wikki Stix to fill-in the remaining parts of the pumpkin’s sides. The seeds for the pumpkin are created with small cut pieces of white Wikki Stix. Press small white pieces of Wikki Stix directly on top of the yellow pulp portion of the craft. Kids can use brown Wikki Stix to label the parts of the created pumpkin. Discuss the parts of the pumpkin craft and invite kids to lay a brown Wikki Stix to the side of that part. 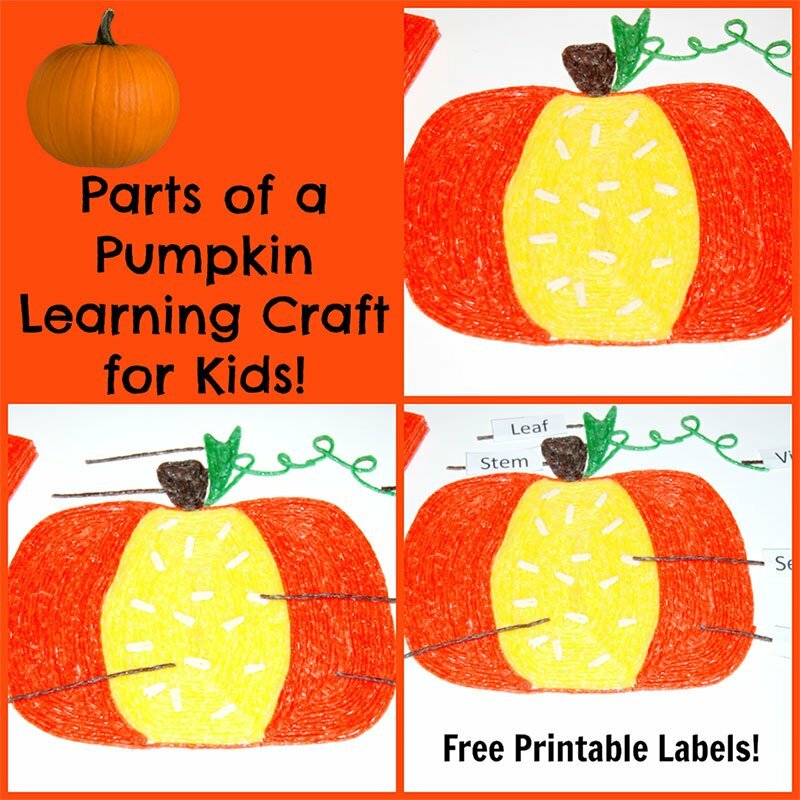 Print the parts of a pumpkin labels (linked above), laminate for durability, and have kids cut the individual labels apart. The paper labels will adhere with fingertip pressure to the brown Wikki Stix without the need for glue or tape. Save the Wikki Stix pumpkin learning craft and parts of a pumpkin labels to encourage playful learning throughout the fall. Lay a brown Wikki Stix to the side of each part. Labeling the Parts of a Pumpkin Craft. Download parts of a pumpkin PDF labels here!